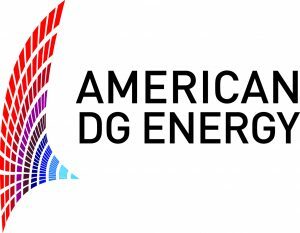 American DG Energy merger: attractive with an 19% spread! 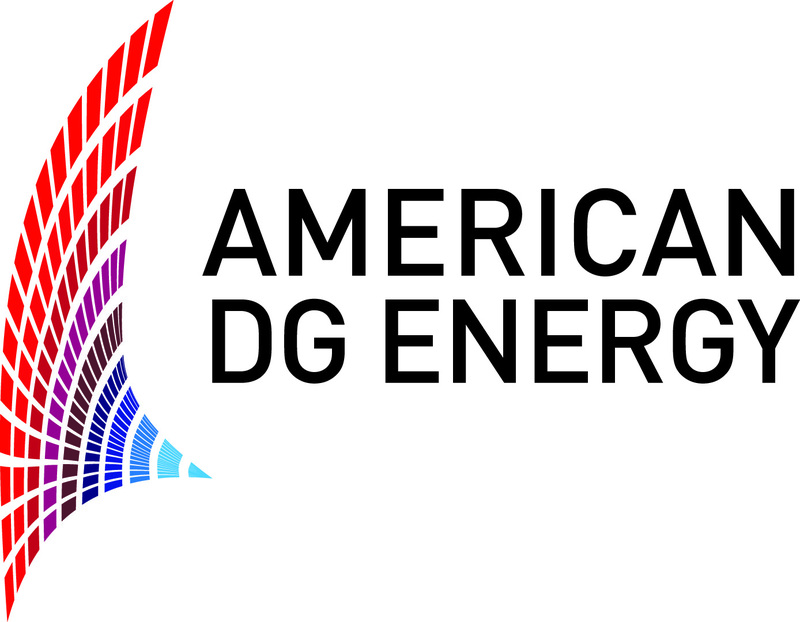 American DG Energy Inc. (NYSEMKT:ADGE) is being acquired by Tecogen Inc. (NASDAQ:TGEN) in an all stock transaction. 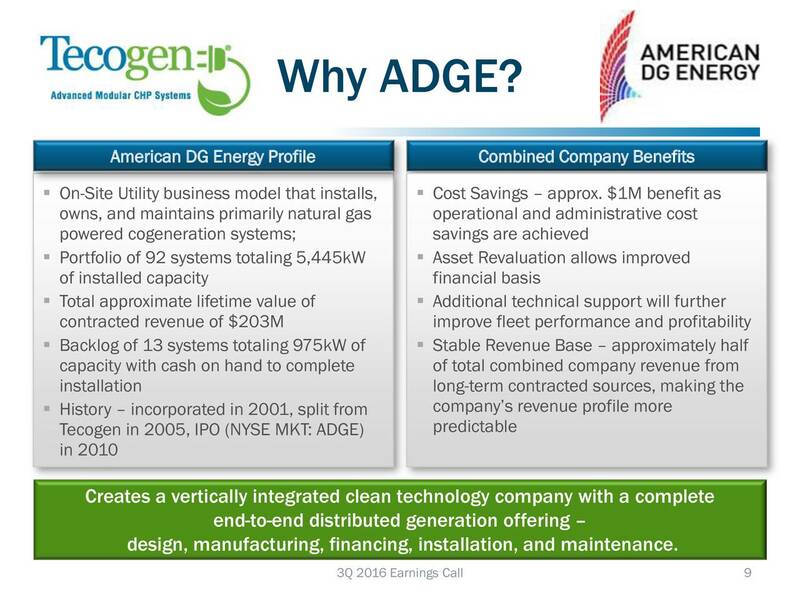 Tecogen is offering 0.092 shares for every ADGE share. What is very surprising is that when the deal was announced the stock price of ADGE barely reacted. ADGE closed just 6.8% higher on negligible volume while Tecogen was offering a premium of approximately 35%. Since then the stock prices of both companies have barely moved and as a result the spread is still an extremely juicy 19%. Note that, because both stocks are fairly illiquid and can have a wide bid/ask spread putting an exact number on the spread is hard, and entering a position at this price might be even harder. I decided to pay up for my ADGE shares. John Hatsopoulos is the co-Chief Executive Officer of both Tecogen and ADGE. Benjamin Locke is the co-Chief Executive Officer of both Tecogen and ADGE. Robert Panora is the President and Chief Operation Officer of Tecogen and General Manager of ADGE. Charles Maxwell is a member of the Board of Directors for Tecogen and Chairman of the Board of Directors of ADGE. John Hatsopoulos together with his family beneficially owns more than 22% of Tecogen and 20% of ADGE. George Hatsopoulos together with his family beneficially owns more than 21% of Tecogen and 19% of ADGE. This obviously makes it easy for both companies to change their mind, and cancel the deal, but I don’t think that is a significant risk-factor in this case. There is really just one party here, and that partly must be interested in pursuing the current deal. Why? Because just getting a merger agreement signed and getting a preliminary proxy statement on the SEC site is an expensive process. You’re not going to spend a solid six figure dollar amount, or perhaps even a seven figure amount, if you aren’t serious. Especially if you are also a shareholder in both companies. So I think that this deal will probably be completed, and I also think it will be completed soon. It doesn’t require any regulatory approvals, and both companies expect to complete the deal by approximately March 21, 2017. Getting shareholder approval should also not be problematic considering the inside ownership in both companies. Insiders own 24.8% of Tecogen and 18.0% of ADGE (and family members related to the insiders own a bit more). They will require some support from outside shareholders, but it is a deal that makes sense and as an ADGE shareholder you get a nice premium, so I don’t see why it shouldn’t happen. The Tecogen Q3 conference call contains a couple of interesting tidbits (not all on the slide) that further demonstrates how closely related the two companies are, and why a merger makes sense. This entry was posted in Portfolio and tagged ADGE, TGEN on January 12, 2017 by Alpha Vulture. Tejoori Limited: liquidating with a 40% discount to NAV? During the year ended 30 June 2013, the Group successfully replaced the Lagoons plots for alternative plots in the Arjan project located in Dubai, UAE. USD 0.6 million of the additional costs incurred on the exchange of plots was payable by the acquirer which has been added to the earlier receivable of USD 3.1 million. However, the acquirer has refused to settle the balance due to the Group. While the negotiations are ongoing to settle the dispute, no impairment has been recognised. The Company intends to, as previously stated, return to shareholders a certain proportion of the cash generated from the sale of the plots undertaken to date and it intends to finalise these details following the sale of the third Arjan Plot. The Company is, in conjunction with its advisers, considering the most effective and efficient manner in which to return cash to shareholders and following the disposal of the third plot the Company will update shareholders further. The Company is also, as part of this review process, evaluating the merits of the Company maintaining remaining as an AIM quoted company given the costs associated with the listing. I expect that the company will fully liquidate after selling the last land plot earlier this year, but it might take some time since they first need to settle the unpaid receivable and if legal steps needs to be taken that might potentially take significant time and money. But I expect that a large part of the money can be and will be returned to shareholders already this year. But since the company hasn’t fully committed to a full liquidation this remains a bit uncertain. One thing that is positive is the current operating costs of the company aren’t that high. Last year administrative and other operating expenses were $177,500. Presumably this amount could be lowered significantly if the company decides to delist from the AIM. But with ~$18 million in equity and a ~$10 million market cap there is I think a sufficient margin of error. A few years of operating expenses isn’t going to destroy all potential upside. As a holding company holding only cash (when the last transaction is completed) this is a very simple situation. If you think that this cash will most likely be returned to shareholders you have a great deal, if you think the company will find a new way to light money on fire it’s not attractive. Given what Tejoori has done the last year, and what they have communicated I think it’s very likely that they are going to continue to do the right thing. At the same time, this isn’t a super high conviction idea and since trading costs are also very high on the AIM market I made this a small position. I think it’s still a pretty good addition to my basket of special situations. This entry was posted in Portfolio and tagged TJI.L on January 9, 2017 by Alpha Vulture. Retail Holdings has seen an action packed week. Chris DeMuth Jr., one of the most popular Seeking Alpha authors, published his thesis on the company last week and called it his top pick for 2017. The market didn’t ignore him, and shares rose 25.8% from $14.70 to $18.50. 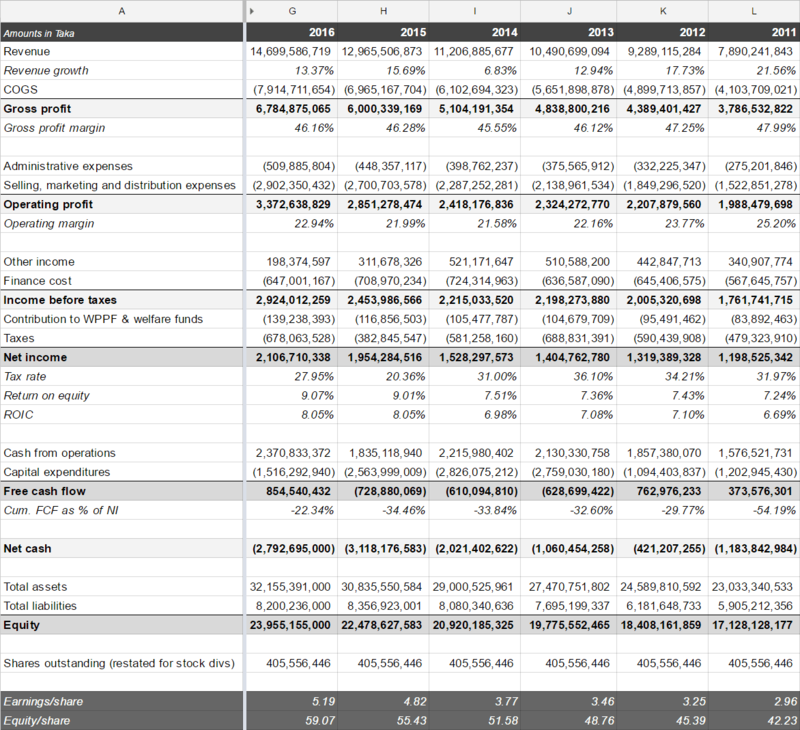 One interesting tidbit that he picked up on, that I failed to spot, is that in the latest annual report the company changed their time frame for the liquidation of the company from 3 to 5 years to 2 to 4 years. It seems like a small detail, but no reason to change that if the liquidation of the company isn’t moving forward. Yesterday Retail Holdings issued a press release with an “updated strategy statement” that reconfirms this two to four year horizon. 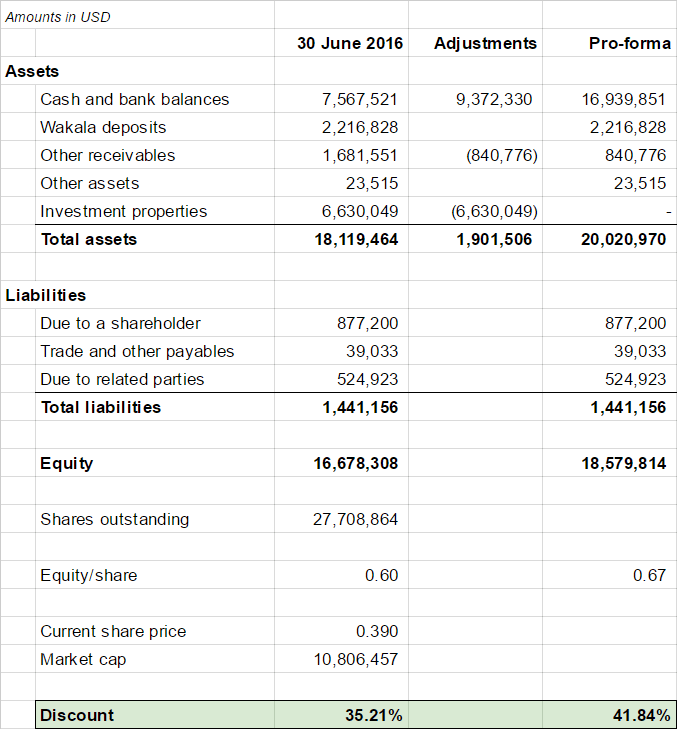 More interesting is that they also confirm that they repurchased 542,782 shares last year, a significant amount since it represents 10.6% of the outstanding shares. Assuming they bought back these shares at $15/share (probably a slightly pessimistic estimate) this grows NAV/share with 5.4% from $27.39 to $28.87. Too bad that the shares are now trading higher, since potential future purchases will be less accretive since they have to be done at a smaller discount to NAV. While I think Retail Holdings is still very undervalued I sold a bit of my position this week. When I called the company “my best idea for 2016” on Seeking Alpha it was trading at an effective discount of 61.5%. Since then shares are up ~70% while the discount is down to 35.9%. Still attractive, just not as attractive as before. This entry was posted in Portfolio and tagged RHDGF on January 5, 2017 by Alpha Vulture. Today I sold the remaining piece of my stake in American Farmland. I had already sold the majority of my stake last year since the spread quickly collapsed after I entered the trade. It started with a juicy 13.2% spread while now just 2.6% is remaining. Since I was only long American Farmland without a corresponding short position in Farmland Partners I didn’t capture the whole shrinkage of the spread. I bought American Farmland at $7.45 and sold my last shares today at $7.98 for a 8.0% return (taking into account a $0.0625/share dividend). If this would be a cash deal I would have tried to capture the last remaining percentage points since this deal will probably close very soon, but since I’m not that thrilled to own Farmland Partners I’m happy to leave a little bit of money on the table. This entry was posted in Portfolio and tagged AFCO, FPI on January 3, 2017 by Alpha Vulture.